Today is the 124th anniversary of the latest calendar year major-league no-hitter, but it wasn’t thrown in a postseason game. 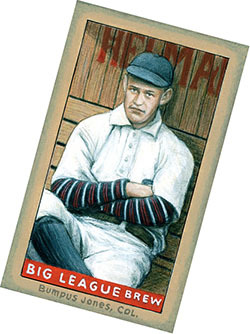 The Cincinnati Reds’ Charles “Bumpus” Jones made his major-league debut on Saturday, October 15, 1892, and made the most of it, no-hitting the Pittsburgh Pirates at League Park for a 7-1 win. Reds player-manager Charles Comiskey, who had watched Jones pitch well in an 1892 exhibition, gave Jones the opportunity to pitch Cincinnati’s final game of the ’92 season. Two pitchers have thrown no-hitters in the first major league starts, but no one else has done it in their first major league appearance.